The World Intellectual Property Organization today (February 8) has issued a statement from its headquarters in Geneva announcing that the United States has become the 50th member of the Marrakesh Treaty. Because the European Union comprises 28 states, the number of countries now adhering to the treaty comes to 78. 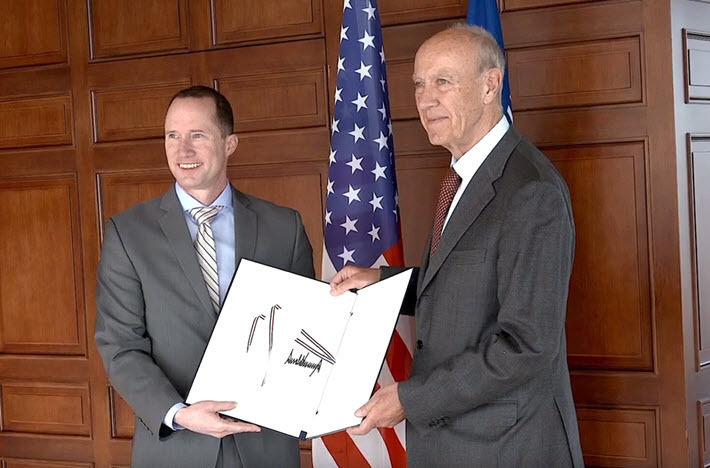 The official notification ratification document from Washington signed by Donald Trump has been accepted by World Intellectual Property Organization (WIPO) chief Francis Curry, with Mark Cassayre, the chargé d’affaires for the American mission to the United Nations’ installation in Geneva. And with that, as many as 550,000 accessible texts have become immediately available to visually impaired people in the countries that have signed the treaty. A full list of those countries is here. As Publishing Perspectives readers know–our first report on the development was in July of 2016–the treaty’s adoption in many parts of the world is being led by publishers’ associations. Strongly endorsed by the International Publishers Association (IPA, also based in Geneva) and in the States by the Association of American Publishers (AAP), the treaty is designed to facilitate access to published works for people who are “blind, visually impaired or otherwise print disabled” by creating a universal copyright exception that will allow authorized parties to “travel” accessible formats to appropriate consumers. The International Publishers Association produced a guide to the treaty dated in the summer of 2013 and its author, Carlo Scollo Lavizzari of Basel, chronicling the early development of the concept and concerns of the treaty. It’s worth noting that this unprecedented universal copyright exception arrives at a time when most of the world’s creative industries are dealing with concerns about various copyright exceptions. Protecting robust copyright regulations has become a focus at national and international levels. This, then, is a testament to what publishers believe is the value of the Marrakesh effort, which can allow copyrighted content in formats supportive of the visually impaired to cross borders under the right circumstances. Some of the considerations that went into the American consideration of the treaty are in our story from April of last year when the AAP’s executive vice-president Allan Adler testified in favor of the American ratification before the Senate Foreign Relations Committee. Today, Maria A. Pallante, AAP president and CEO, has issued a statement for inclusion in WIPO’s announcement, saying, “We pause to celebrate this moment as the United States formally joins the Marrakesh Treaty. Gurry, speaking for WIPO, is quoted today, saying, “The Marrakesh Treaty is WIPO’s fastest-growing treaty and we hope it becomes a universal one soon, so visually impaired people in every corner of the globe can more easily benefit from learning and culture no matter where it is created. Information about the Marrakesh Treaty is available at the WIPO site here, and the documents, including a summary, are available here. They include versions in Braille, full audio, and Daisy format. The Marrakesh Treaty was adopted on June 27, 2013, in Marrakesh and it forms part of the body of international copyright treaties administered by WIPO. A video produced by WIPO for the occasion of the American ratification is embedded below. More from Publishing Perspectives on the Marrakesh Treaty is here. Has everyone abandoned all critical thinking when it comes to this treaty? I know we could all use some good news, but this hype is getting absurd. The US has had a copyright exception since 1996 and it has failed miserably to help students with disabilities. Now, with no evidence whatsoever, we are supposed to believe the Marrakesh Treaty will ‘end the book famine’? Please don’t shoot the messenger, but it wont. In truth, it’s the opposite of what is needed, which is to support local publishers around the world to publish in accessible formats.